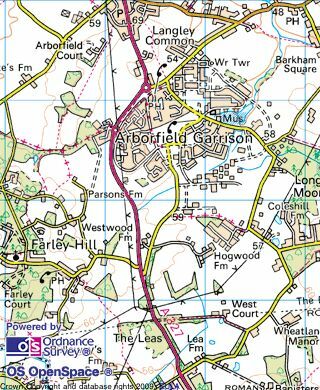 This week we had another Arborfield Community Forum, held this time in the old Arborfield Garrison Community Centre, now being managed as the Arborfield Green Community Centre by Crest Nicholson. Unlike some community forums in the past there weren’t any new announcements, but it did provide a good way to see a lot of the players building the Arborfield Strategic Development Location together in one place, as so often they will present whatever new development or plan they are putting forward in isolation. Crest of course were there, and for a number of people the main topic of conversation was the development going on on the public open space they had fenced off and sold on to Westbuild Homes where the church car park used to be. 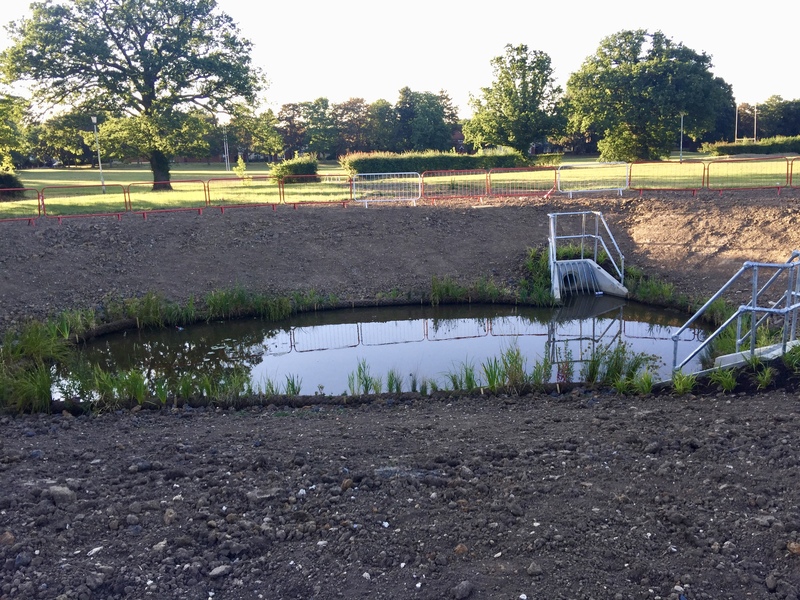 Particular concerns were the absolute eye sore the developers had created digging a balancing pond in what was supposed to be retained public open space, and also that the night before the site had not stopped working at 6pm as they were supposed to. Crest have already taken Westbuild Homes to task over the late working, ironically for one of the most controversial parts of the development the site had bitten back and the reason for the late working was their drilling rig had got stuck, indeed you could see the drill stuck in the same spot for several days this week. With regards to the balancing pond with the current hot weather we’re stuck with it looking a mess for a while at least as any attempt to turf it or seed it at this point wouldn’t take. Crest were also presenting the plans for more blocks of flats for the rental market on a site next to the Bohunt School access road. Moving on to the other large developer on site, back in March Legal and General the new owners of the southern part of the development went out to consultation on changing the agreed design and layout, and they were at the Community Forum presenting these new plans again. Much as when Crest took over the northern part this is really just a rearrangement rather than any major changes, so the second primary school on the site has been relocated to a more central location, and the employment area has been moved too. There is also a change to the routing of the Nine Mile Ride extension which may well serve to lower its attractiveness as a cut through. There was also representation from Millgate Homes who have bought the parcel of land on the Rowcroft Barracks Princess Marina Drive directly adjacent to the Community Centre and St Eligius Community Church. This is going to be a small development of houses, with a block of apartments. From the council there were two displays, the first was for what has provisionally been named Arborfield Primary School – although I’m sure it has been pointed out that it is in Barkham! This will initially be a two form entry school with provision for it to subsequently expand to three form entry as Arborfield Green is built out and with the plans for the Barkham Square extension to the development. Site wise it will be based around what was the third rugby pitch behind the wire on Biggs Lane. 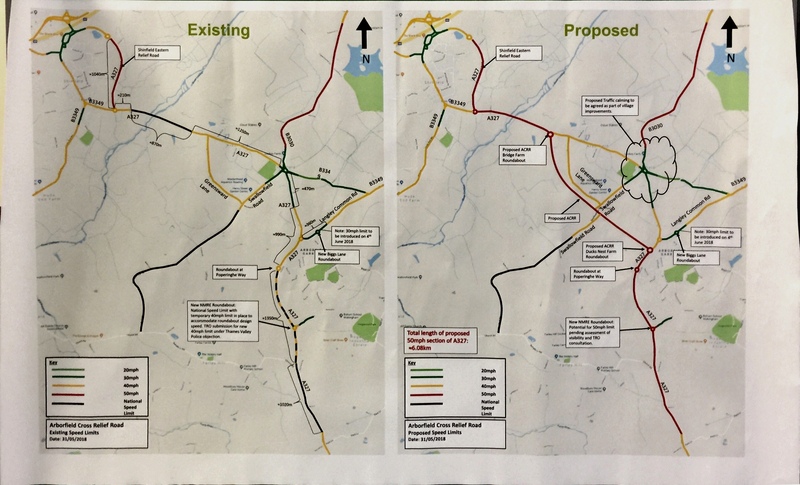 The other council display was about the upcoming Arborfield Relief Road – the plans for this have been pretty stable for a number of months, but the more interesting part was the ongoing discussion over speed limits. As you may be aware there is currently a temporary 40mph speed limit from the Poperinghe Way roundabout down to the Church Road turn up to Farley Hill. This was always planned to be made permanent, indeed the Nine Mile Ride Extension Roundabout was designed and built for traffic to take it at 40mph. 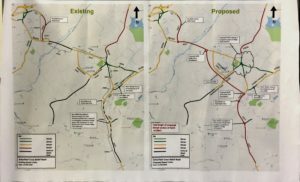 However the map the council had on display highlighted that Thames Valley Police had objected to the speed limit being cut to 40mph, so the council had a new plan that once the Arborfield Relief Road is open regularises the speed limit along the length of the A327 from the edge of Finchampstead to the Shinfield Science Park to 50mph. This involves cutting the limit from 60mph in some places and raising the 40mph in others, most notably past Poperinghe Way and the current pedestrian crossing before the new relief road splits off. In general having a consistent limit seems like a good idea rather than the current limits that change up and down, however we do think the council needs to look carefully at the crossing by Poperinghe Way as we know people already have experience of traffic on the A327 not stopping at those lights, so much as with the new Relief Road where the footpath is being put on a bridge, an alternative to a road level crossing needs to be considered. 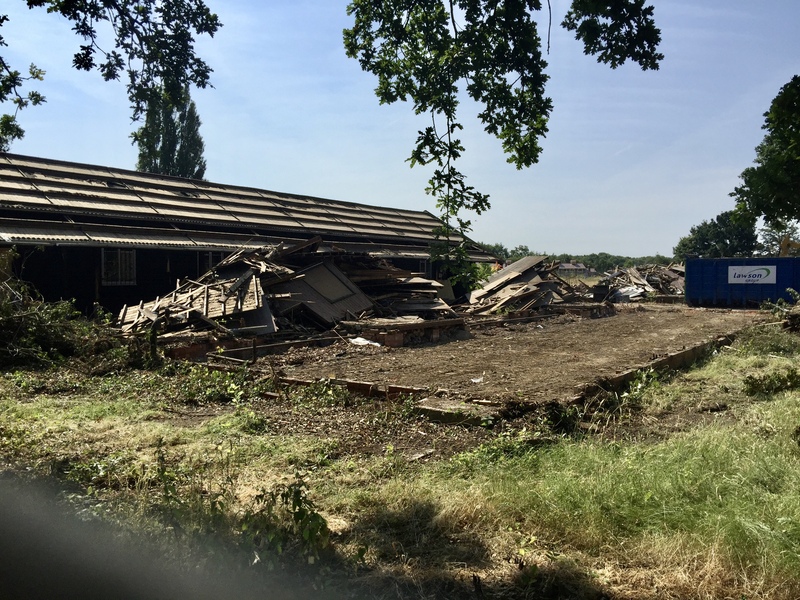 The other talking point locally is the very visible campaign by Barkham Parish Council petitioning against the Barkham Square development, which can be found here. What the council is actually petitioning for is to force a discussion in council over “unsustainable development in Barkham”. But that is all the petition is for – Wokingham Borough Council can quite happily have the discussion, and then do absolutely nothing. 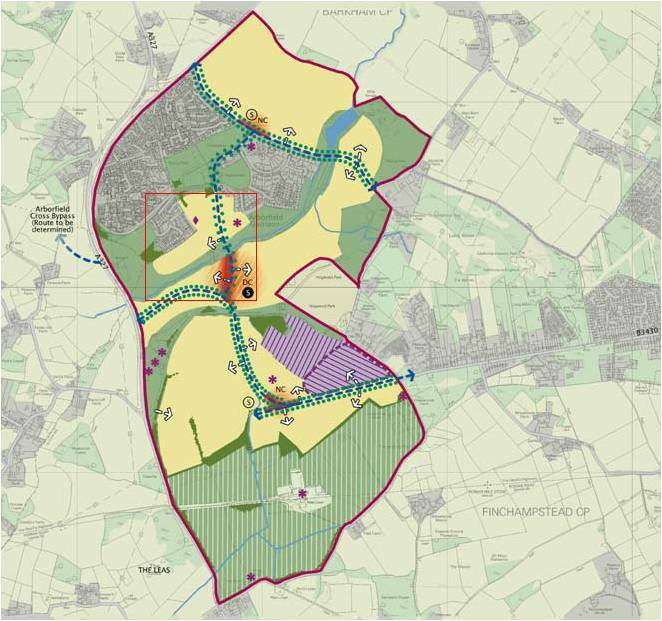 It’s worth highlighting that the same arguments about sustainability are being made by the campaigns against the other locations being talked about for the next phase of housing, which are development on green belt land around Twyford and Ruscombe, and the 10,000 home development on rural Grazeley near junction 11 of the M4. 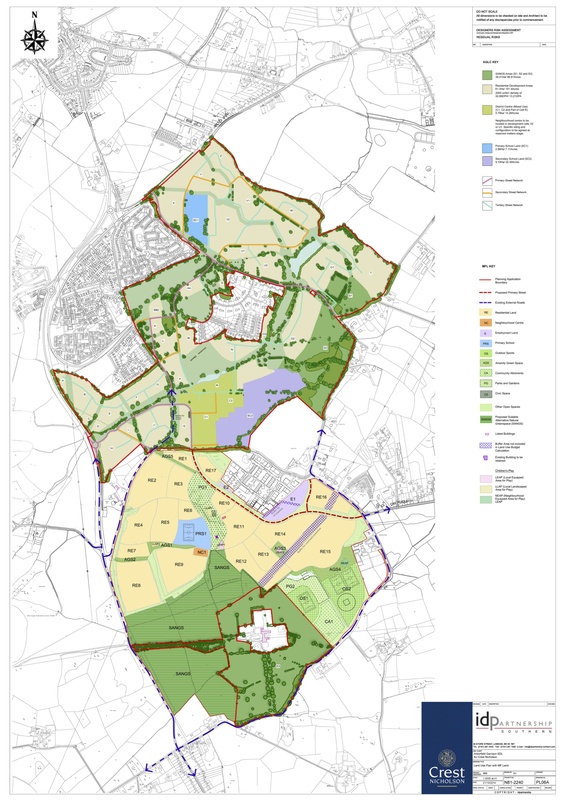 As we have said previously, Barkham Square is the least controversial site under discussion, as it is an expansion of the existing Arborfield Green development, but early enough that the schools and district centre can be build for 4,500 homes rather than the planned 3,500. The main argument against it is that it will bring the Arborfield Green boundary very close to Barkham Village, and this is a separate settlement from Arborfield Green, but Barkham have rather neutered their own argument by having now moved their parish council offices out of Barkham Village into Arborfield Green, and very prominently argued that the 1,800 houses of the 3,500 on Arborfield Green being built in Barkham are part of Barkham through school naming arguments, arguments over the name of Arborfield Green as a whole, and the new very obvious big green signs marking the boundary of Barkham. Unfortunately, being realistic it is almost inevitable that we will get more houses around Arborfield Green. The pressure for houses is coming from Westminster, not Wokingham. 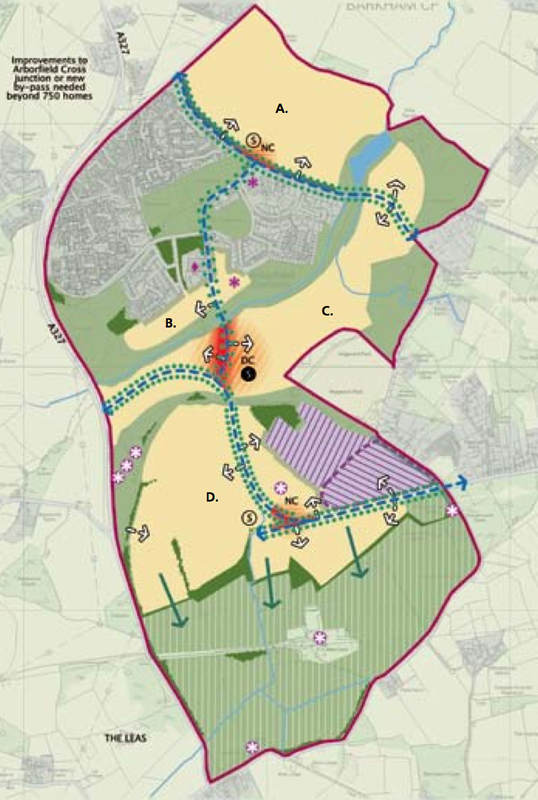 The council uses two basic criteria for establishing development locations, firstly brownfield sites, which was the basis on which Arborfield Garrison was selected as the largest development last time around, or secondly expanding existing settlements which was the basis of the Wokingham North and South strategic development locations, and the South of M4 location. 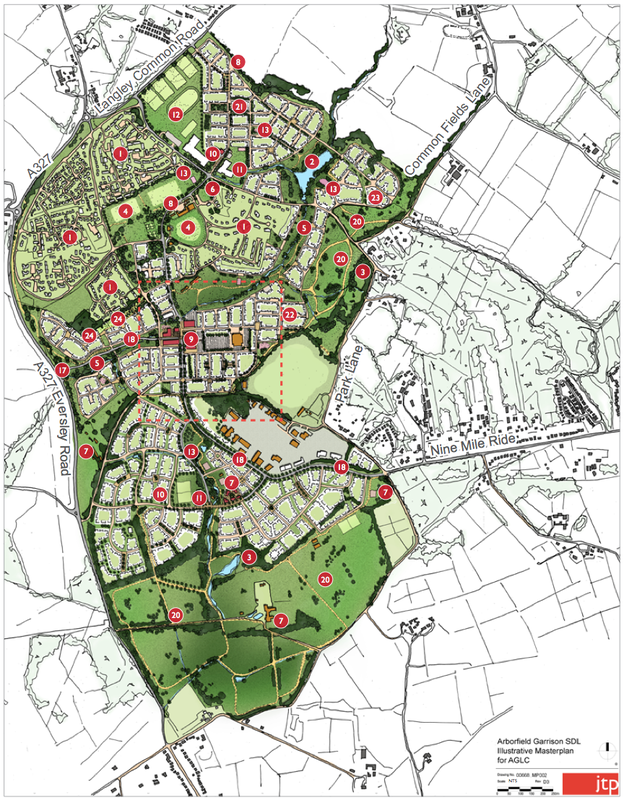 Arborfield Green now has become an established development that can be expanded, and is especially attractive because it will have a modern district centre, has a big secondary school and two large primary schools being built already, so it would need less infrastructure than a totally new development. The national housing policy is for significant new housing development in growth areas like Wokingham Borough, so the houses have to be built somewhere. If the council refuses all developments the Westminster Government will approve them anyway, but without consultation with residents or much council involvement at all. The Barkham campaign has already been labelled as NIMBYism by other parts of the borough, and to some extent the borough council trades off small campaigns from each particular area campaigning against each other, Grazeley residents are as passionate about their rural village as are Barkham, and Ruscombe residents are as passionate about preserving their village as are Barkham too. Really what we as a borough residents need to do is stop arguing against each other with leaflets like the Barkham one which says houses can be built in “other places”, and sit down and be realistic as a borough and answer the question – the government says we need to build these houses, where are we going to put them? 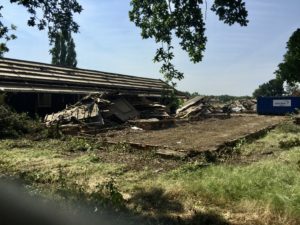 As we did at Arborfield Green, if the houses are going to come anyway, the questions we as a community need to be asking are not how do we stop all housing development here as that is unrealistic, but what do we as a community need in place to allow us to support the housing we are being asked to take. Do they need to provide a Medical Centre to support the extra houses? Do our schools have enough places? Do we need more road improvements? Is there enough green space?